Government surveillance is a tricky subject in any language. 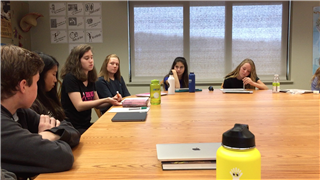 On October 19, Honors Spanish 4 students participated in a Harkness discussion about the balance between privacy and safety. Without advanced preparation time, students eloquently expressed their thoughts in Spanish. Profe. Brady said she was extremely impressed with students' level of dialogue and their respect for different perspectives.